As a top-end, Best Buy rated bike, the Diamondback 510Ic comes with a set of nice features, of which the most important is its up to 16 resistance settings that can be adjusted to the user’s particular fitness level. By the same token, athletes can select between 14 workout programs that mimic just about any type of terrain, from mountain to hills and everything in between. Additionally, heart patients can take comfort in the 4 cardiovascular programs that will help them keep a close eye on their heart rates. 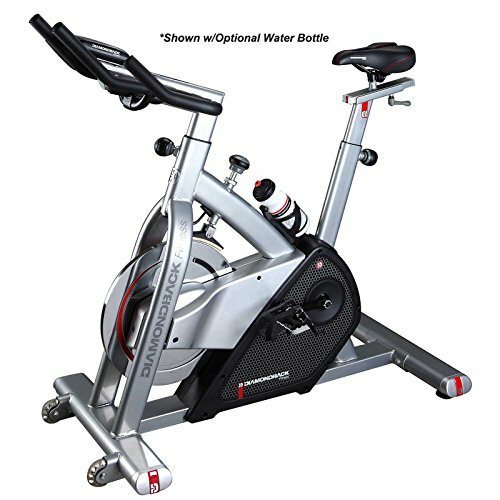 The indoor cycle is even equipped with a brilliant blue backlit LCD screen that displays your fitness-related data such as distance covered, calories burned, time, cadence and heart rate. The Diamondback 510Ic also boasts an ultra-sensitive heart monitor placed on the handlebars to closely track your cardiovascular goals. Perhaps the most striking feature is the battery-free display option: indeed, your pedaling motions will generate enough energy to power up the console leaving you free from endless cables and power outlets. The 510Ic known as being one of the most comfortable on the market since both the handlebars and the saddle are thickly padded to keep any discomfort at bay. The 510Ic fits any size since athletes can also adjust the seat vertically and horizontally according to their individual height, and the handlebars on the fore/aft position to adjust to different arms and torso lengths. The Diamondback 510Ic is an exceptionally heavy model, which means that it remains completely steady even during the most energetic workouts. This feature is enhanced by the heavy-duty 31 pound flywheel which provides excellent momentum, enabling you to quickly tone up your quads, glutes and calves. Because of the heavy flywheel, athletes can experience an exceptionally smooth riding motion and equally quiet cycling experience. Lastly, since this machine can accommodate an impressive maximum user weight of 300 pounds, it can easily be used by anyone looking to shed unwanted weight. The high weight capacity also enhances the machine’s longevity and durability, which means that your machine can last for several decades- if not for life- with the proper care. *Water Bottle is not included. If you have any questions about this product by Diamondback Fitness, contact us by completing and submitting the form below. If you are looking for a specif part number, please include it with your message.